OK, I'm an engineer without stars in my eyes. Here is what to expect from the L2D Q5. The build-quality is 90 out 100. The chinese are getting much better,but it isn't German quality. It's on-par with a US-built product. Fit and finish are excellent. The Switch is fine. Depression pressure to actuate it is just right. Cycling through the modes works perfectly. The Cree LED puts out a very nice color temperature. I was surprised at how nice. the light is white with a very slight green tinge - a good tinge. It is superior to ANY LED flashlight I own. Light output at 12 lumens is the same illumination as a Brinkman 2xAA. At the next step up, it is a serious light..similar to a 5 cell brinkman incandescent. At 105 lumens it is dam bright. This is the level at which you can light up an area at night. The transision from it's hot spot in the center to the flooded area is nice...about exactly what you would want most. At Turbo 180 lumens it perks up about 50% and for short periods, you can amaze yourself. Let's get real. It doesn't look like a million candle power flood. That said, your eyes won't need 30 minutes to re-adjust to the dark once you turn it off. The strobe mode is fast and powerful. The SOS mode is too slow for me (being a code man)...but anyone would recognize it as SOS. Having tried out a regular L2D-CE and being impressed I decided to see if this Q5 was any better. Essentially, the Q5 is exactly like the L2D-CE with the same battery runtime but is brighter on all modes. This is what really peaked my interest in this light. As advertised, it lives up to this claim much to my joy as companies don't always deliver what they promise. The turbo mode of 180 Lumens (vs 135 for the L2D-CE) is just incredible power for such a small flashlight running on just 2 AA batteries. For those wondering if I can really see the difference between the two, the answer is absolutely yes. This flashlight is astonishingly bright on Turbo mode, so bright that's it's like someone shrunk a larger handheld spotlight into something as small as a mini-maglite! To me though the coolest thing about this flashlight is being able to run it on "Low mode" (12 Lumens) for 80 hours straight if you run Energizer E2 Lithium batteries (around 55 hrs on low mode on Alkalines) but having the ability to switch to different modes, all the way up to an incredible 180 Lumens if you really need a bright light. I bought this as an outdoors\camping light because of the its extreme runtime on Low mode but also having the versatility of a brighter light if needed. FYI Low Mode (12 Lumens) is about as bright as a late model mini-maglight (non-LED) if not brighter so this mode has enough light most basic tasks. The clicking tailcap is easy to use and seems to work well so far. Overall just a monster flashlight in a very small package. I just got this flashlight recently and have been very impressed by the light output and versatility. First, it's very small and only uses two AA batteries yet it's incredibly bright!!! Even at the lowest setting of 12 lumens which is brighter than your ordinary mini Mag (I own mini maglite non-led and there's no comparison whatsoever). I'm also impressed by the fact that it has a few modes on it ranging from the 12 lumens (great feature as it saves battery life) to the very bright 180 lumens !!! Let's just say that at times I don't need to use the powerful brightness, then there's the 12 lumens which is plenty enough to find keys, etc but if I NEED to change a tire by the dark roadside, I'll be glad to have the powerful 180 lumens at my disposal. There's no such option on maglites nor any other quality flashlights in this price range! You're pretty much stuck with one light mode and that's that. Furthermore, the construction on the Fenix is very solid, aircraft? aluminum with durable coating and reportedly waterproof. Additionally, there's a talon hole to attach a lanyard. I can't comment on the quality in the long run and although Chinese made, does seem high quality and alot of value. The brightest flashlight I've ever owned and well worth the investment. I bought this flashlight a few months ago to take to Egypt so I could pretend I'm an explorer and crawl around inside of things and illuminate dark areas. Compared to a regular flashlight I was using and that I thought was bright, the Fenix L2D completely obliterated the other flashlight. True story: I got to go inside the Great Pyramid of Cheops in Cairo and since it was dark (and extremely humid, but that's another story), everyone had their flashlights out. I pulled out this flashlight and overpowered their flashlights so much that I attracted a few people who were interested in what I was shining my light on and even got a few "wows" out of how bright this was. And this was even without it being super bright! Quantum leap in flashlight technology! Unbelievable! I received my L2D-RB100 a few days ago and am utterly amazed just how much light this 2AA flashlight can produce. I have no scientific light measurement equipment, but doing the backyard-eyeball test, this light looks as bright as my 6D cell Mag-lite. It looks like it's two or three times as bright as my 3D cell Mag-lite. - The L2D-RB100 seems as bright as my Mag-6D, however the Mag does a better job as a spot light (when focused to a tight beam). Both the Mags yellow-incandescent light and adjustable focus made it possible to easily light up and see depth and texture of the tops of trees that were many hundreds of feet away. With the L2D there is a bright center spot, however there is a ton of spill around the edges that seems to light up every dust/water molecule in the air and washes out your long distance view. - On the flip side, because the L2D has a lot of spill, it is fantastic for lighting up a room or outside space that is relatively close. It has a bright center and smoothly spills out with no rings, dead spots, etc. With my Mag-lites if I de-focus the beam to get a broad light there is always a large dead-spot in the center. - The L2D has a strobe mode. Some say it's good for self-defense but frankly I would much rather have my 6D Mag-lite if I ever found myself in that position. The L2D strobe is almost as disorienting to the user as the recipient and then what? Are you going to knock the guy out with your 5 ounce Fenix? I could see using the strobe in a signaling/rescue situation though. - The fit and finish of the L2D is outstanding. The shape is rather odd with so many different diameters along the barrel, however it feels fine in my hand. The click switch in the end is very crisp and works well. I wish Fenix would have designed the controller to start in whatever mode I last used. As it's currently designed, when you turn it off, it reverts to the default settings. - The light from the Rebel-100 LED looks yellow-green to me. Sounds awful but it's actually pretty good. I like it better than the blue-white that a lot of LED's produce. - Dirty little secret, that I didn't discover until purchasing the L2D, is that the instructions say you shouldn't use the "turbo" mode (175 Lumens) for more than 10 minutes at a time or it may harm the battery/flashlight... So it seems that turbo mode is targeted for a quick look-see, using the strobe, or showing off how much light this tiny light can produce. - I considered the Surefire 6P which I think looks nicer, and is domestically built, however I could not bring myself to buy a light that uses $2.00 batteries (CR123A) when I can get AA's for $.20 each. It won't replace every flashlight I have, but it's easily the best all around flashlight that I own! With the exception of extreme spot-light use or baseball-bat emulation (self defense), the L2D covers all my hand held lighting needs. I can't comment on the long term Fenix reliability having owned it for only a week. Pros: Uses cheap AA batteries. Amazing light output (175 Lumens). Very good for broad illumination (hiking-trails, indoor-use, etc.) Superb light pattern with no dead spots/rings. Multiple light output modes lets you choose battery life/brightness trade off for different situations. Excellent fit/finish. The utility of this flashlight is amazing. The ability to choose from multiple light levels means you can get the right amount of light for the task, not sacrificing battery life for wasted light. Using AA batteries means that a source of power is available almost anywhere at any time. The extreme brightness on "high" and "turbo" provide that extra oomph if and when you really need it. Not too bright . . . I just bought this light and first I should point out that there is a newer version called a LD20 that is out and should be considered. Essentially the newer light has some different styling touches but at heart is the same. 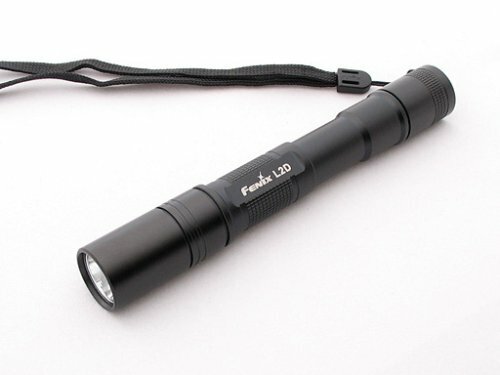 Although most people just want one flashlight, the head of this light can be attached to the bodies of the Fenix L1D (1 AA battery so it isn't quite as bright) and P2D (1 CR123A battery, just as bright but much shorter) which can be bought separately (there are newer versions of those too called the LD10 and PD20). The brightness is just amazing. I can light up the tops of the trees in my neighbor's yard or light up a whole room by bouncing light off the ceiling. But that brightness can be overkill for a lot of situations so it is nice that you can dial it back to more reasonable levels and enjoy longer battery life as needed. The strobe and SOS modes seem unnecessary: I would rather just be able to cycle through the four levels, or turn the head to one and leave it there. For people who aren't used to high-end flashlights, this will seem expensive and the multimode Mini Maglite LED is a decent substitute at half the price. But there is still plenty of value in the Fenix which competes with other lights that cost twice as much (or more). Compared to the Maglite this has a metal reflector, better build quality, and more brightness so it is a step up in lots of ways.